Roofs…possibly the most important component of your home that is most often unnoticed. Until you hear that drip… drip… drip… your roof is leaking and you have no clue why. As you scramble to grab the pots and trash cans to catch the drips you begin to wonder, “How is old my roof?” “Is it time to replace it or should I just get it patched?” Now that you have the drips contained you call your insurance company to find out if you are covered then come all the questions about your roof, and all you can say is “I don’t know.” Let’s try to answer some of these questions to help you get better acquainted with your roof. Roofs come in many different styles, from very simple Gable roofs to somewhat complicated combinations like the Hip and Valley roof. Homebuilders continually combine different styles of roofs to create many pleasing looks to put on top of homes. Follow this chart as you lovingly glare at your confounded leaky roof and determine what style you have. So now that you have identified the style of your roof we can look at the roof coverings and determine whether or not you have shingles or …..something else. The purpose of the roof covering is to repel the water away from the home. The most common type of roof covering you’ll encounter is asphalt shingles. Those come in two basic categories: 3-Tab and Architectural shingles. Some other common types of roof coverings are metal, slate, wood, clay. 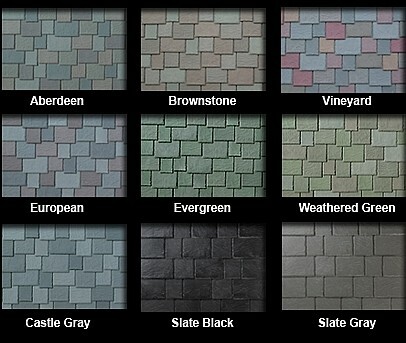 3-Tab and Architectural shingles come in a variety of colors and durability. Your standard asphalt shingle can last upwards of 20 – 30 years depending on your climate zone and the severity of the weather. Metal Roofs come in different types of metal like copper, aluminum, and steel. These can be fashioned to mimic other roofing materials like clay tiles or wood shingles. Metal roofs provide an excellent protective covering and can have expected life spans up to 80 years. Slate roofs are made from one of the most durable natural products known to man, which is stone. Slate roofs can last from 60 -150 years if given the proper TLC. This quarried product comes in a variety of colors from greens to blues and can give the home a beautiful touch. Wood Shingles come in two styles, wood shake and wood shingle. The expected life span for these can vary depending on the climate and quality of the wood used for the shingle. Typically you can expect to get 25 years from well-maintained wood shingled roofs. Clay tile roofs are an excellent choice for the ecofriendly. Clay roofs can last for well over 100 years given the proper care. They can be damaged by hail or other large debris falling on the roof. Clay tiles can come in several colors but the typical color is the terracotta normally found on the homes in the southwest. Now that we have covered some of most common types of roof coverings, how can you tell the age? The best way is to have the all the documents from when the roof was first installed. Unfortunately those records get lost easily when the home has been sold once or twice. Another way is dependent on when the home was built. If the home was built in the 60’s or 70’s you can pretty much guarantee that the roof has been replaced once or twice. So the roof could be between 15 – 30 years old. If the home is newer (built in 2000 or later) the roof may be the same one the builder installed unless there was extensive damage done during a storm and was replaced. If you have or can locate the records for the last roof installation hold on tight to them. Those papers could contain valuable warranty information as well. Climbing on a roof can be very dangerous and should not be done unless you are a qualified professional. So with that being said I do not recommend that you climb on your roof. You can however let me do it and take that risk for you. A Professional Home Inspector like myself can inspect your roof and give you a better idea of its condition and evaluate other aspects of your home. If you have concerns about the condition of your home, looking to buy or sell give me a call and schedule a home inspection.